Is any one else as excited for FALL as I am!? It's easily my favorite season. Always has been. 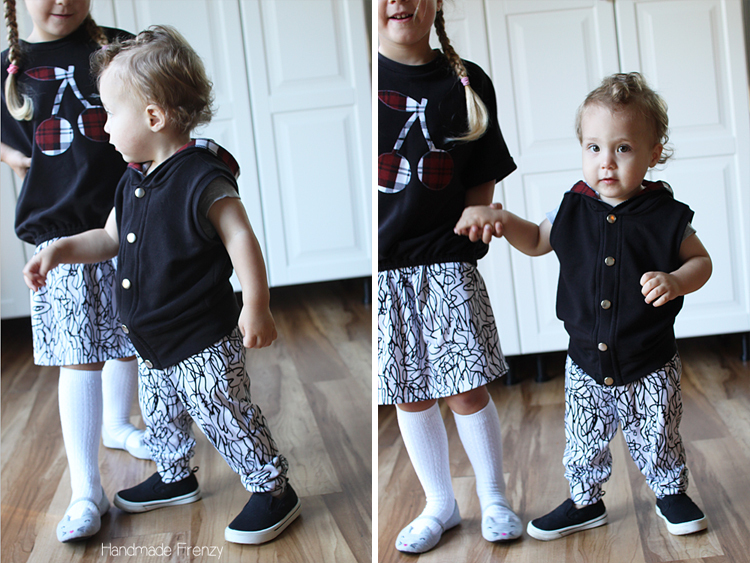 And sewing for fall is so much fun too! *NOTE: Scroll all the way to the bottom of the post for a fabric and pattern summary! I recently got a few yards of fabric from Finch Fabrics. When I was choosing them, I had fall sewing in mind. Then Josie from Finch suggested I try this scrumptious, dreamy Black Modal French Terry to pair with the Jackson Scribbles Knit. 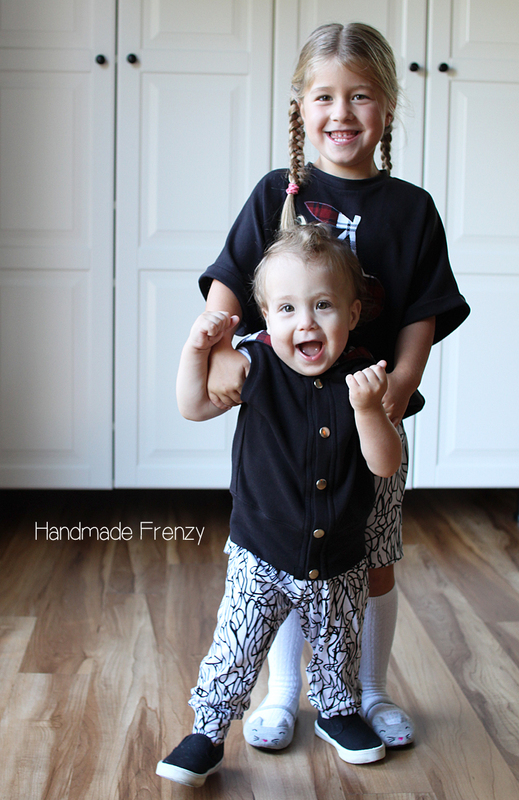 When it came and I got my hands on it, I decided to make outfits for BOTH of my youngest and to plan them around the french terry! It is sooooo soft and lovely, the modal in it makes it feel super luxe. It's not too heavy either, which I love for our warmer fall. It has a really lovely drape as well. The drape of the fabric worked especially well on this Kaleidoscope Top I made for Olivia. I love how the boxiness of the top worked to show off the fabric drape. 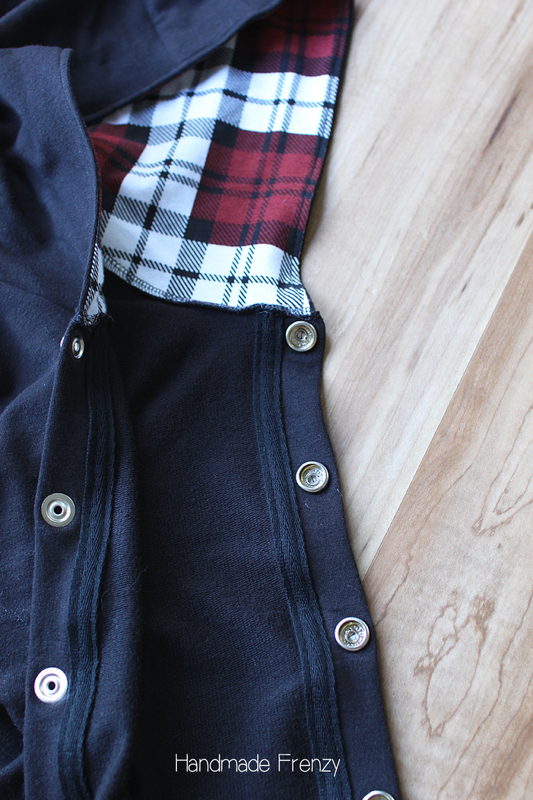 The french terry also worked well on this little hooded vest I made up for my little mister. 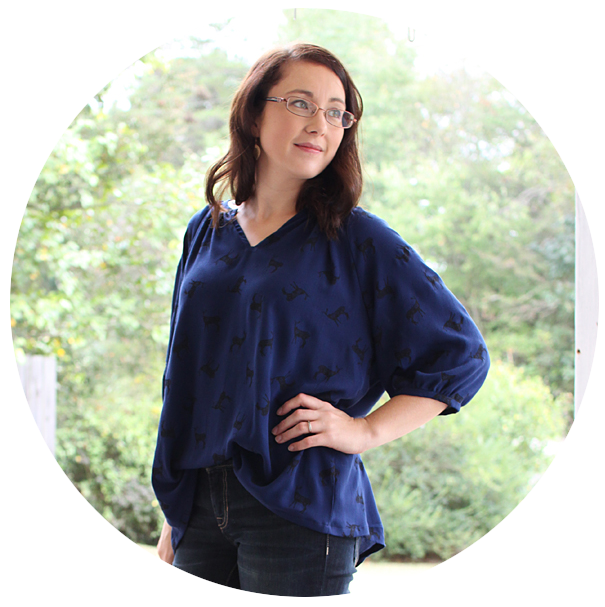 I've worked with some other french terry fabrics and it never worked well as bindings like I used on O's neckband and A's armbands, so I was pleasantly surprised when this particular one did much better! It still doesn't have as much recovery as a rib knit, so I wouldn't use it for anything that needs to be super fitted, but for this loose neckband and the armbands it worked very well! For the bottoms I used the Jackson Scribbles jersey and OH. MY. WORD. I almost can't handle the cuteness. The jersey was great to work with, it did curl a little like all jerseys do, but it pressed very well and sewed up very nicely! 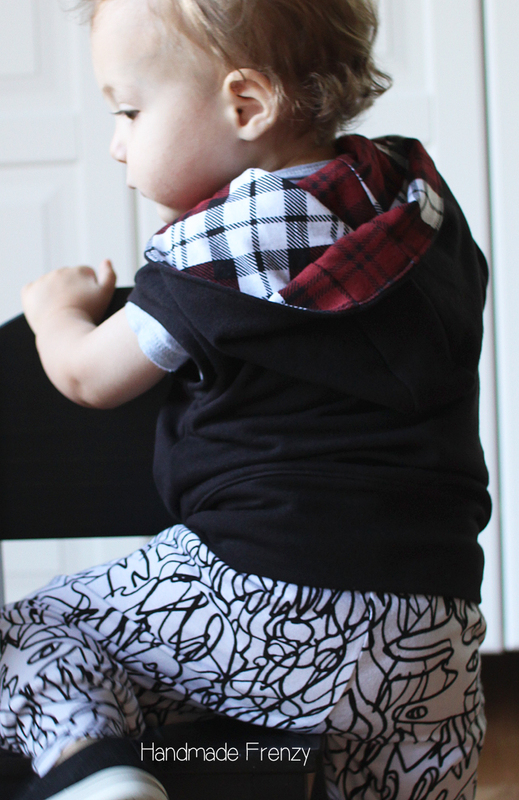 It is fairly lightweight, but opaque, so it's great for kids' bottoms. I happened to see this plaid knit in my stash and couldn't not use it for accents! It paired so well and added even more of that fall touch that I was going for! Now for a little bit more about the patterns I used! Since Olivia is my most willing model, I'll start with her outfit ;) For the top, I used the Kaleidoscope Top by See Kate Sew. I made her one a few years ago and just this spring packed it away! It is the shirt that keeps on giving! The boxy oversized style works well for a LONG time. I made a couple of simple changes this time. First, I cut as per the pattern for the neckline, but then instead of folding under and stitching as directed, I added a neckband. I wanted a higher neckline since it's easier to not have to worry about a tank underneath and it doesn't fall off her shoulders this way. Next, I made a size 4, but lengthened to the size 6. Then I inserted 1/2" elastic to the bottom, rather than the 1" the pattern calls for. Very happy with the length it came out to be. I made an applique with a cherry shape, the plaid knit, and wonder under, then used a straight stitch around the edges to secure it more permanently. For the skirt I started with Thread Faction #106. 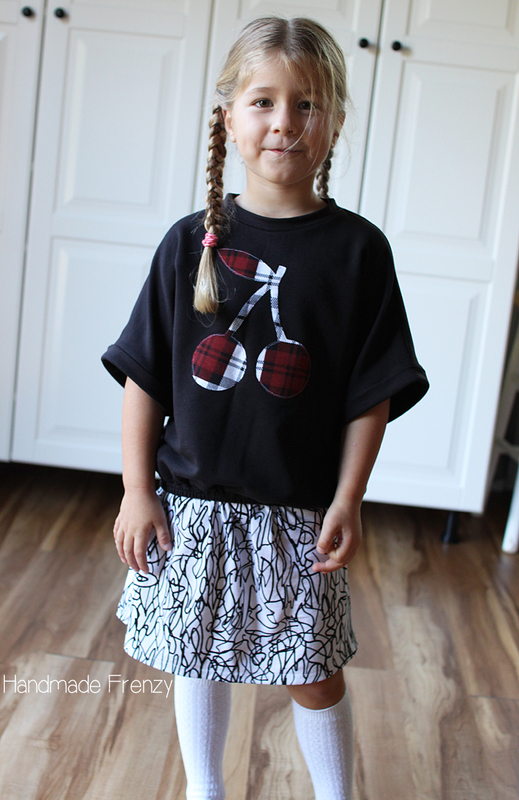 I made the shorts and waistband as per the pattern, but then just cut a rectangle, twice the length of the waistband and 12" long for my 5 yr old. Then just gathered the rectangle to fit the the waistband and proceeded with the pattern directions. We both just love those built in shorts under skirts! Makes getting dressed super easy too. The vest is a heavily hacked Grandpa Cardigan, also by Brindille & Twig. I used the bodice and waist cuff pattern, but straightened out the center front and added a button placket. I left off the sleeves and slimmed the shoulders down by about 3/8" then added armbands to finish. Finally I added on the Rowan Tee hood in a size 12-18 month. It was a perfect fit with no changes! Last was to pop on those snaps. I'm LOVING the way it turned out! 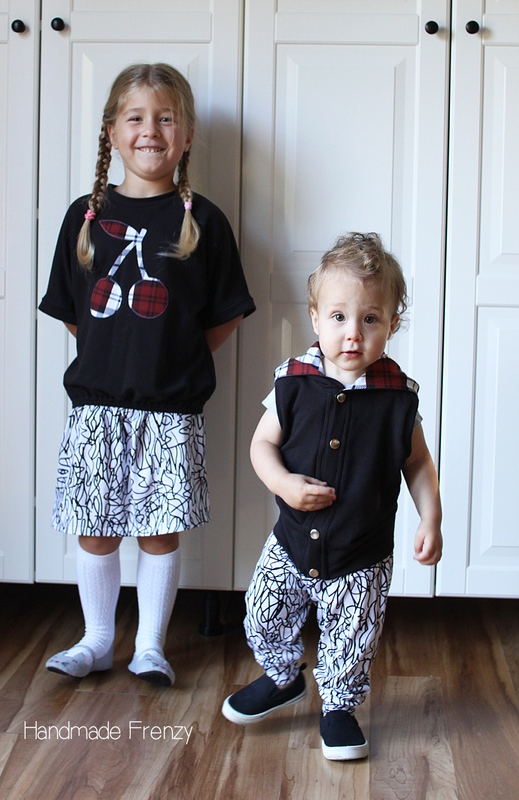 And now for a photo dump of my cuties (I'm not biased)! Neckline raised by adding neckband rather than turning under and stitching. Size 4 - lengthened to size 6. Used 1/2" elastic in waistband rather than 1". Made a gathered skirt by cutting a rectangle twice the width of the waistband x 12" long. 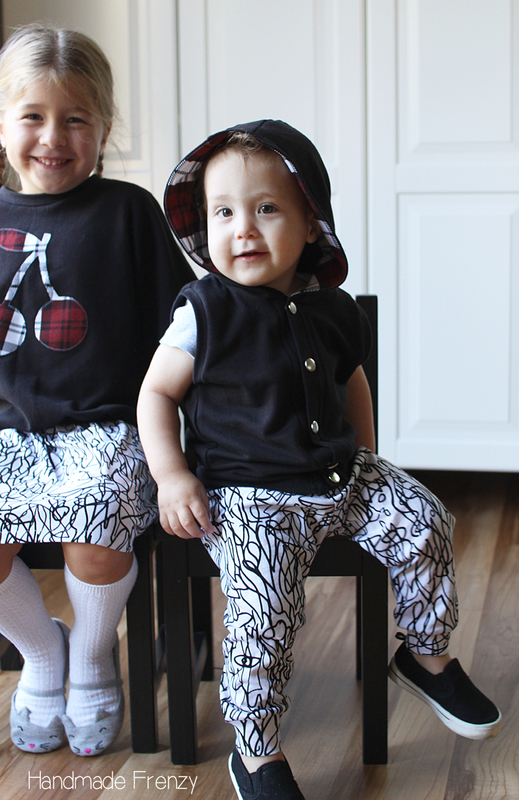 Size 9-12 mo, lengthened pant legs by 1", added 1/4" to height of waistband cuff. 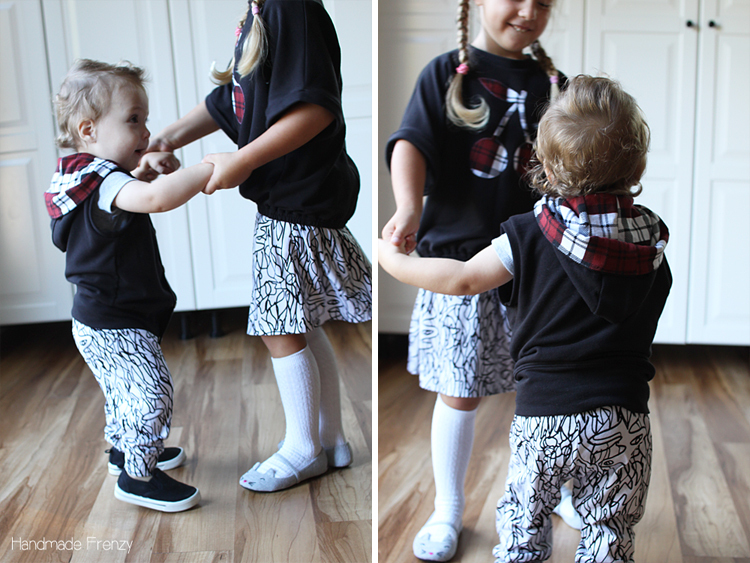 Oh they look so cute together :) And their outfits are fantastic!